More Boschi Pope Skate Off 2018 edits have been released. Check the latest from Timergy, “The third edition of the Boshi Pope Skate off took place at Washington heights, NYC. Hamilton skatepark.” – Timergy. “This one’s dedicated to Rob G.
Year number three! 2018’s Boschi Pope Skate Off was successful; not only for the event itself, but with people coming from around the world, it made for an incredible weekend here in NYC. Anywhere you turned, whether it was a skate spot for a session, a local coffee shop for breakfast, a cheap diner, someone’s apartment, or our signature: the bodega–there were skaters flocking from all directions. Lots of respect to those who were involved to make it all happen. Cheers to the good times!” – Butter TV. Clips from the final round of the 2018 Boschi Pope Skate Off brought to you by Rollerblade Terminal. Check out the first edit of the third annual Boschi Pope Skate Off that went down Sunday. Brought to you by Jordan Baez and Ghetto Community “Boschi Pope skate off 2018 brought to you by Ghetto Community” – Ghetto Community. The third annual Boschi Pope Skate Off went down yesterday at the Hamilton Bridge Skatepark aka the Heights Skatepark. With skaters and viewers coming from all over the world it truly was the biggest event in NYC. Malik Ashby, Erick Rodriguez, and all the judges put together a great competition and had the difficult choice of picking the top three winners and a best trick prize thrown in by John Estrella. See the results and highlight photos below. Stay tuned for all the edits to follow. The third annual Boschi Pope Skate off has been announced. 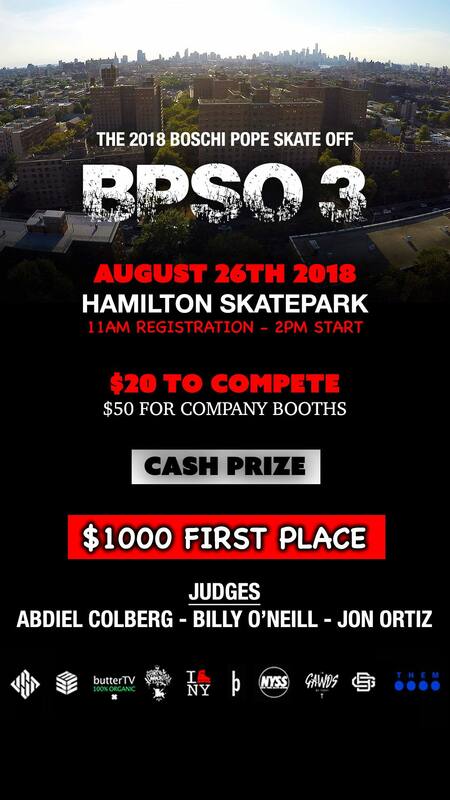 Sunday August 26th, 2018 at Hamilton Bridge Skate Park. First place gets $1,000! Special guest judges include Abdiel Colberg, Bill O’Neill, and Jon Ortiz. Make sure to register via the Registration page. Date: Sunday August 26th, 2018. “This is called the reunion. The second annual Boschi Pope Skate Off was a great follow up to the previous year. Lots of great people made the trip to NYC and as always it was nothing but good vibes and great skating.” – Butter TV. See photos from the BPSO 2017 at Butter TV.